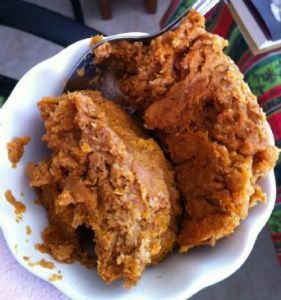 This is sooo yummy, you won't miss pumpkin pie. And is as filling as a dessert can be! This is a favorite recipe I found in a magazine but I "play" with the ingredients. You can lighten the recipe with light cream cheese and yogurt, use splenda, part whole wheat flour, and use part apple sauce for the oil - but here is the recipe in its original form. Very pretty and satisfying too! Note that it is best made the night before you want to eat it! Pumpkins are a tasty source of vitamins and minerals, particularly beta-carotene, vitamin C, and potassium. It also helps prevent arterosclerosis, or hardening of the arteries, which can lead to strokes and/or heart attacks. Note to Self: Don't change a thing! It is perfect! Enjoy this irresistibly moist and flavorful bread. Delicious for breakfast or snack. One batch makes two large loaves; one for now and one for later. Or bake into mini loaves. They make great gifts for teachers, neighbors and friends!